UFS Explorer License supplied with the software. NEVER download or install the software to the storage you have lost your information from. This can result into permanent data loss. 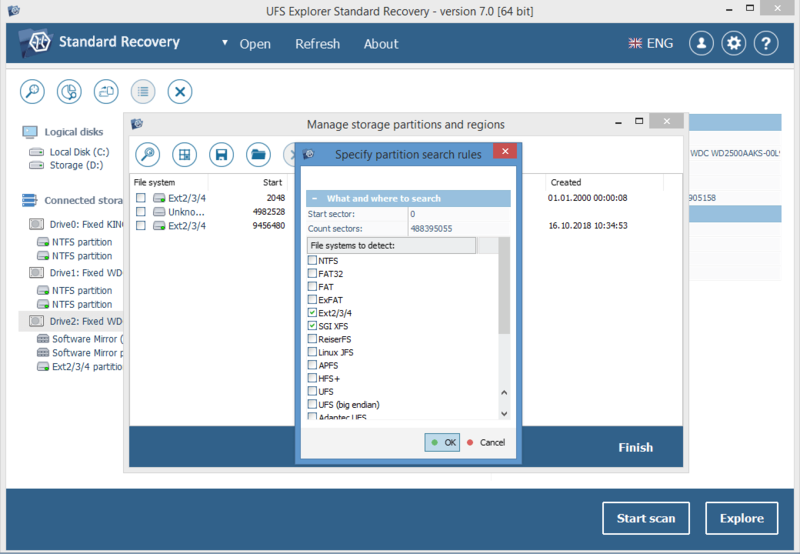 In case of data loss from a system partition it is strongly recommended to shut down the system and consider using UFS Explorer Emergency Recovery CD. 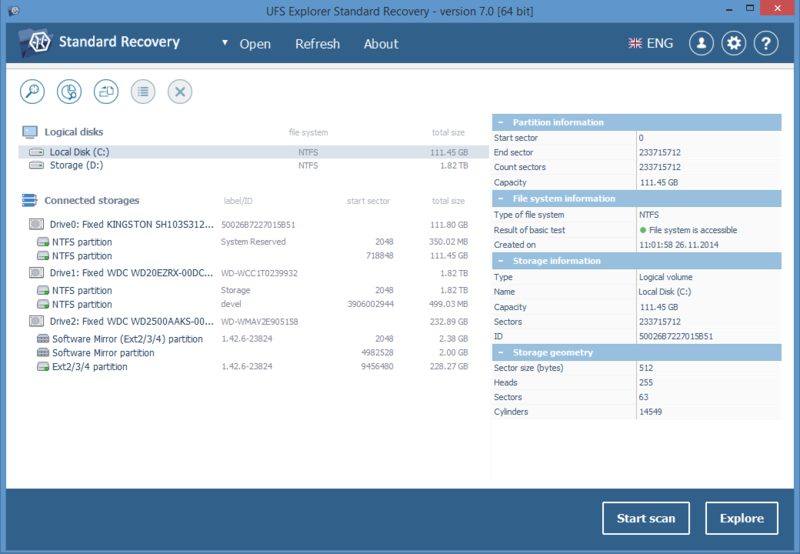 UFS Explorer Standard Recovery is efficient data recovery software for most widespread data loss cases. This cross-platform program is installable on Windows, Linux and macOS and allows recovering lost and accidentally deleted files from a wide variety of file systems applied in these operating systems. The software is adjusted to work with various internal and external storage media. This program fits for data recovery from different devices and supports disk images and virtual machines. 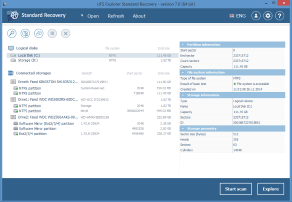 UFS Explorer Standard Recovery can recover lost files from your PC, USB flash drive, memory card of your photo or video camera, external hard drive as well as a virtual machine or disk image file. UFS Explorer Standard Recovery supports data recovery from a wide range of file systems applied in Windows (FAT/FAT32/exFAT and NTFS), macOS (APFS, HFS+), Linux (XFS, Ext2, Ext3, Ext4, Linux JFS, ReiserFS, UFS/UFS2, big-endian UFS, Btrfs, simple ZFS volumes). 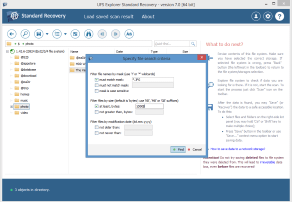 An additional option of pre-recovery file system testing allows users to reconstruct a corrupted file system before starting the data recovery procedure. The utility provides an option of automated assembly of spanned volumes for cases when the metadata is correct. UFS Explorer Standard Recovery supports metadata of various storage technologies, including Apple Core Storage, LVM, Logical Disk Manager, mdadm, etc. The software offers several scanning options for quick shallow scanning, longer profound search for lost data and scanning by known content using the IntelliRAW technology. For more convenience, the scanning procedure can be paused for checking the intermediate result while the scan results can be saved for further work with them. 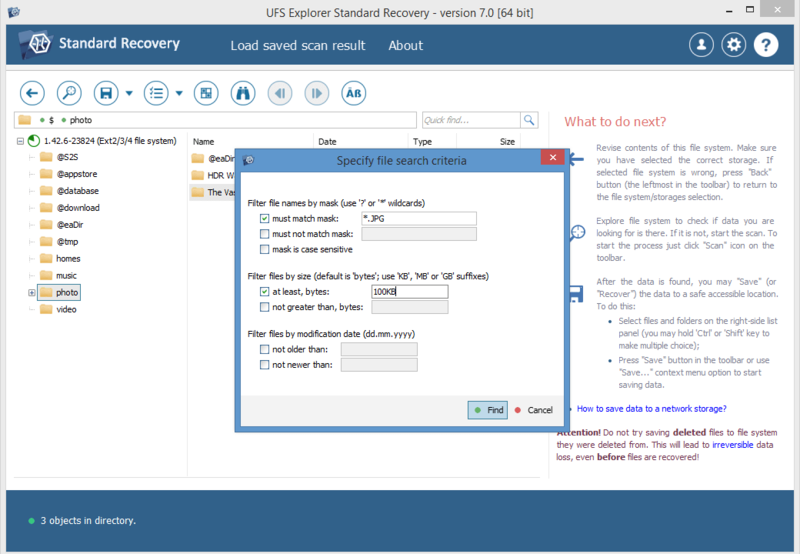 UFS Explorer Standard Recovery is enhanced with helpful options of previewing the found files of most common formats, like images and documents (including PDF), and sorting them by date, size and name. With the IntelliRAW technology enabled, the software provides the found files in separate file format-specific folders for more convenience. full support: data access, search for lost partitions, RAID recovery, recovery of deleted files, recovery after formatting and file system damage. full support: data access, search for lost partitions, recovery of deleted files, recovery after formatting and file system damage. full support: data access, search for lost partitions, RAID recovery, recovery of deleted files, recovery after formatting and file system damage. Support of NAS devices and custom servers. full support: data access, search for lost partitions, RAID recovery, recovery of deleted files, recovery after file system damage. full support: data access, search for lost partitions, RAID recovery, deleted files recovery, recovery after format and recovery after file system damage. full support: data access, search for lost partitions, RAID recovery, recovery of deleted files, recovery after file system damage. Support of both NAS and custom servers. data access, search for lost partitions, RAID recovery for both little-endian and big-endian variations. 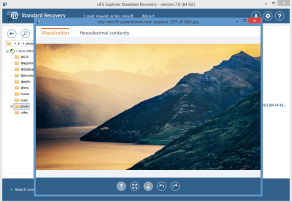 Recovery after file system damage. Very limited recovery of deleted files. data access, search for lost partitions, data recovery from simple volumes, deleted files recovery. The "Save" function of certain hexadecimal viewer/editor dialogs is disabled. Linux: Debian Linux 6.0 (or compatible) and above. * Reworked LVM module for latest LVM2 (with added DM RAID function); * Assignment of LVM names to LVM partitions and logical volumes; * Option of automatic saving of scan state immediately after full scan; * Simplified process of removal of opened storage components; * Regular update to embedded pictures viewer. * Support of ZFS-on-Linux custom ZFS metadata; * Support of "bogous" FreeNAS RAID10 (mix of simple disks and mirrors); * Fixed bug with multiple detections of NT LDM volumes. * Added support of old HP-UX LVM; * Added support of R-Studio image file format (RDR-files); * Updated support of Apple DMG files; * macOS: Added placeholder for inaccessible disks; * macOS: Fixed bug reading disks with sector size 4KB. * Added support of QCOW/QCOW2 virtual disk image format (QUEMU, XEN etc. ); * Added support of VirtualBox VDI virtual disk format; * Fixed some interface-related bugs. * Added support of ZFS ZVOL objects; * Significantly enhanced scan of APFS file system. * Added optional 'total' progress for files copying; * Added 'stop copying' option for 'duplicate file' conflict; * Reworked reporting of files list/total data size; * Modified p.6 of EULA (Territory). * Added more parititon indicators; * Updated embedded viewer component. * New scanning procedure: pausing and restoring options, previewing and saving intermediate results. Copyright © 2004-2018 LLC SysDev Laboratories. All rights reserved.